South Tyrol (Italian: Alto Adige) stands for Mediterranean joie de vivre, good wine, spectacular scenery and romantic mountain flair. Let’s just forget for a moment that there is really no love lost between the Italians of the North and South. Rather than Italian, the preferred language In South Tyrol is German, combined with the charming Tyrolean dialect of the region. To be more precise, there are over 40 different dialect variations here. German is the mother tongue of over 62 percent of the population, Italian of about 23 percent and four percent, mainly in the Dolomite region, speak Ladin. 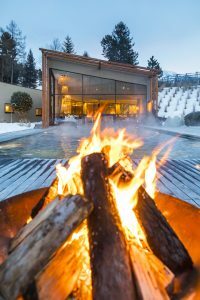 Since May 2017, the Alto Adige has a new jewel in its crown – the 4-star Hotel Seehof Nature Retreat in Natz near Brixen. 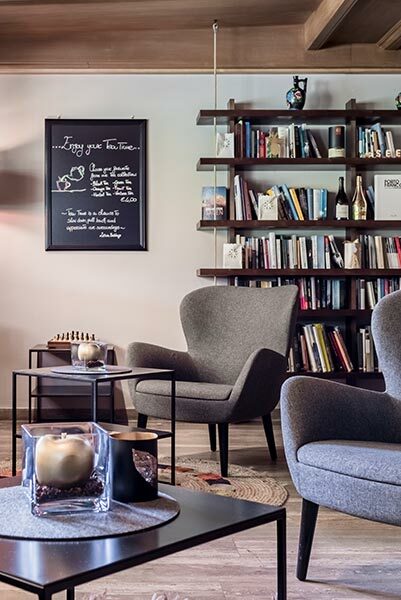 Spouses Tamaris and Andreas Auer, who grew up in the hotelier business, have given it the motto “Moments of Calm”. The hotel, which they inherited from Andreas’ parents, has undergone a complete renovation and blossomed into a true gem. Alpine down-to-earthness and the lightness of the Mediterranean go hand in hand here. The modern building blends perfectly into the landscape and as soon as you enter the Nature Retreat it’s like being transported to another dimension where the stress and hectic pace of everyday life just falls away. The experience is particularly magical during Advent, Christmas and New Year, when snowflake after snowflake drifts from the sky outside. It’s a time to pause. A time to just enjoy. 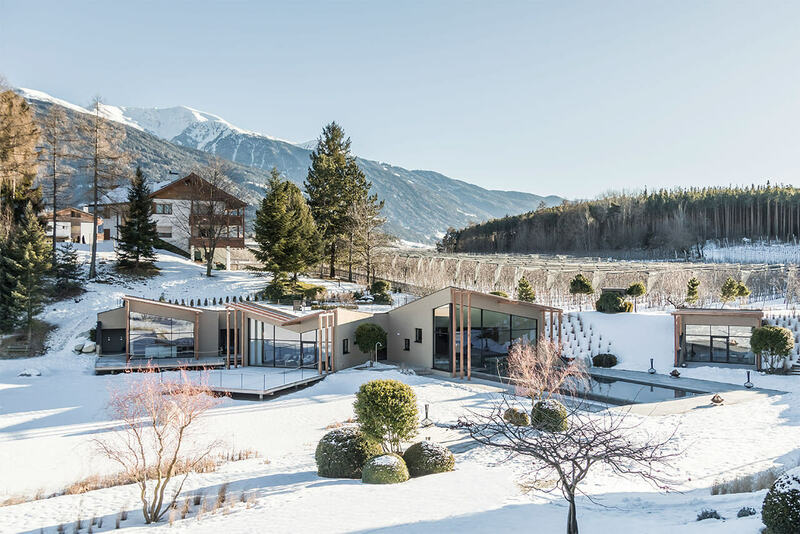 Stefan Rier and Lukas Rungger, students of star architect Matteo Thun, one of the region’s most renowned sons, designed the house with their Bolzano architecture firm “Noa” . 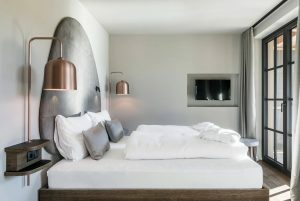 Its bright, airy rooms, some with open-plan bathrooms, reflect Thun’s clear, minimalist style. Muted earth and stone colours, accentuated with a hint of lavender and copper tones, can be found throughout the buildings. The latter are in remembrance of the owners’ grandfather who, in 1958, pioneered the laying of water pipes to supply the high plateau with running water for the first time. The Yang of architecture nestles into the Yin of the landscape. Directly in front of the spacious terrace with its cosy lounge sofas, the hotel’s natural lake spreads out like a private lake stage. In winter, the sight of the mists drifting over the lake is spectacular. 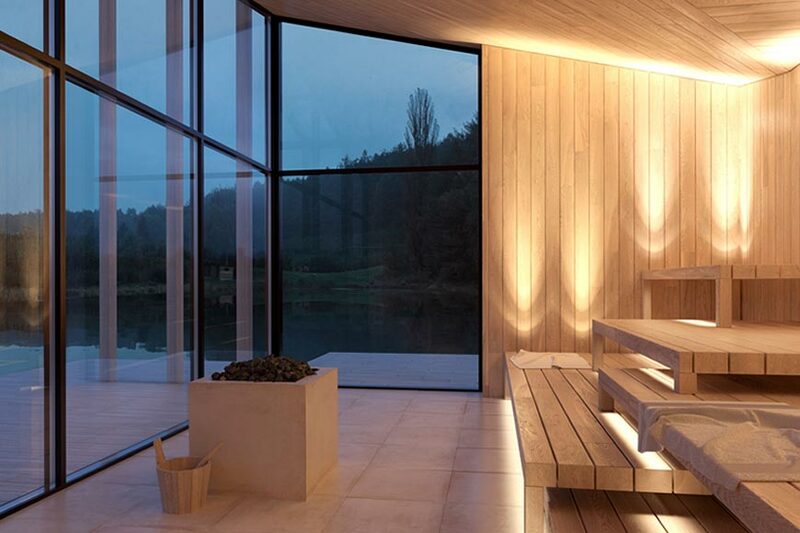 A view of the water can be enjoyed from the glazed panorama sauna of the “La Primavera” Spa where a variety of Wellness therapies, tailored to the individual needs of each guest, are available. 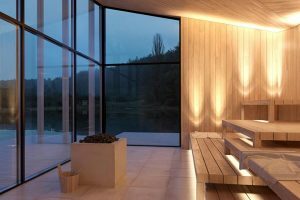 Here one can allow the stress of everyday life to slowly ebb away with a relaxing facial or one of the Spa’s fantastic body therapies. 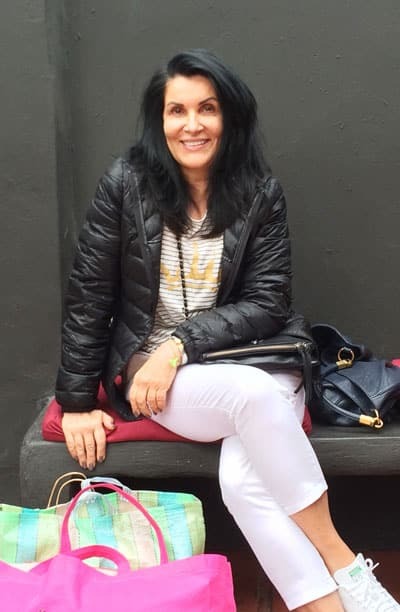 All treatments are carried out with products from the German cosmetic line Babor , supplemented by care products from the South Tyrolean firm Vitalis and Team Dr. Joseph. The hoteliers also attach great importance to the regionality and freshness of the products used in the restaurant sector, from meat and vegetables to organic dairy products and local honey. Apple orchards start right outside the door and extend as far as the eye can see. Just in front of the evening restaurant there is the “Borgo dei Sapori”, a “Marketplace of Pleasures”. Three times a day, a wealth of delicacies for breakfast, lunchtime pasta and the typical South Tyrolean afternoon snack “Marende” piles up there. 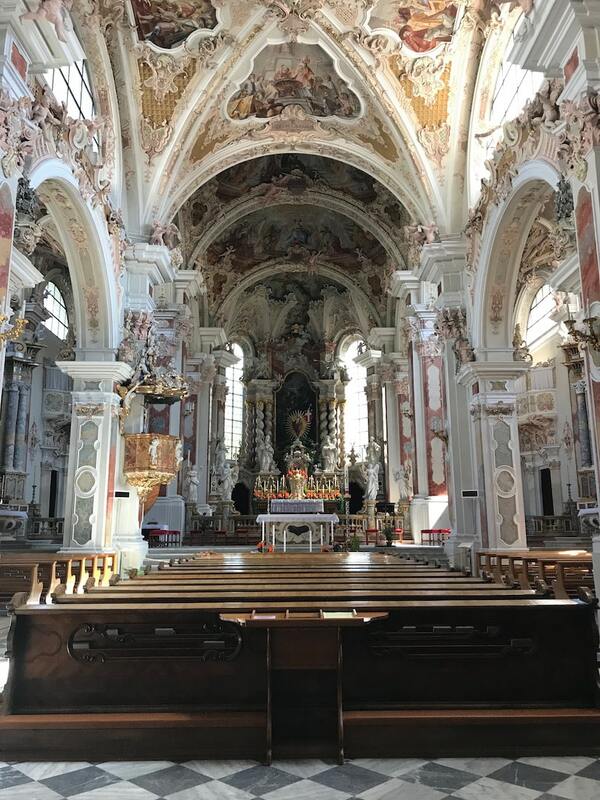 Every morning, hotel manager Andreas Auer invites his guests to join him in a winter walk to explore the area in and around the historic diocesan town of Brixen. If you prefer, you can set out from Natz on your own on foot, by car or mountain bike. In December Brixen boasts the most wonderful Christmas markets. The arcades, with their exquisite boutiques, invite you to shop to your heart’s content or pause to enjoy a delicious indulgence in one of the enchanting cafés. A stop in one of the rustic restaurants to enjoy the typical South Tyrolean fare is a must. 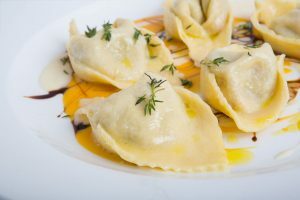 This cuisine offers a perfect blend of hearty Tyrolean home-cooking with a light Italian-Mediterranean touch and the specialities such as barley and tortelli soup, Schlutzkrapfen (stuffed pasta), Ladiner risotto, Kaiserschmarrn (sliced sugared pancakes) and Strauben (fried pastries) are definitely worth sinning for. Kloster Neustift, in the municipality of Vahrn near Brixen, is Tyrol’s oldest and largest monastery. It was founded as an Augustinian cloister by Bishop Hartmann in 1142. There is much to discover in the extensive complex, from the Romanesque collegiate church, which was reconstructed in the Baroque style in the 18th century, to the inner courtyard with its fountain depicting the Seven Wonders of the World, the Rococo library, the Turkish Wall and, above all, the rotunda of the Castel Sant’Angelo, formerly a hospice and defense complex. Theatrical guided tours are available on a variety of themes: “Following the Elephant’s Trail” is an introduction to Brixen’s history from the Middle Ages to today. “Between Superstition and Medicine” deals with quaint treatment methods and remedies. One also learns why curious decorative hangings such as crocodiles, unicorns or elk hooves adorned the historic pharmacies. Those who like it scary can book the night walk “Witches, Executioners and Scoundrels”, which winds through the dark alleyways of the old town to hair-raising stories of gruesome crimes and dark myths. Tickets can be obtained at Brixen Tourism. Plose, at 2,500 metres above sea level, is Brixen’s landmark mountain. The extensive mountain massif with its peaks, Telegraph, Pfannspitze, Gabler, offers a spectacular view, lots of sunshine (South Tyrol enjoys 2000 hours of sunshine a year), chalet fun and wonderful winter hikes, to the Rossalm for example. The 45 kilometres of ski slopes with eight lifts are every skier’s dream. The nine-kilometre long Trametsch is the longest prepared downhill run in South Tyrol and presents a very special challenge . Thanks to the proximity to the Dolomites and Kronplatz one can venture out on extensive ski safaris here as well. 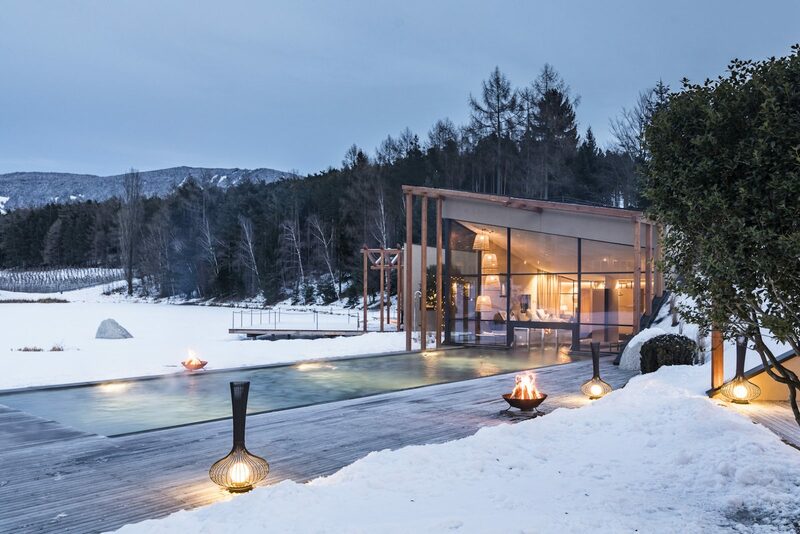 For those who prefer to stay in the lowlands, cross-country skiing or ice-skating are enjoyable options. 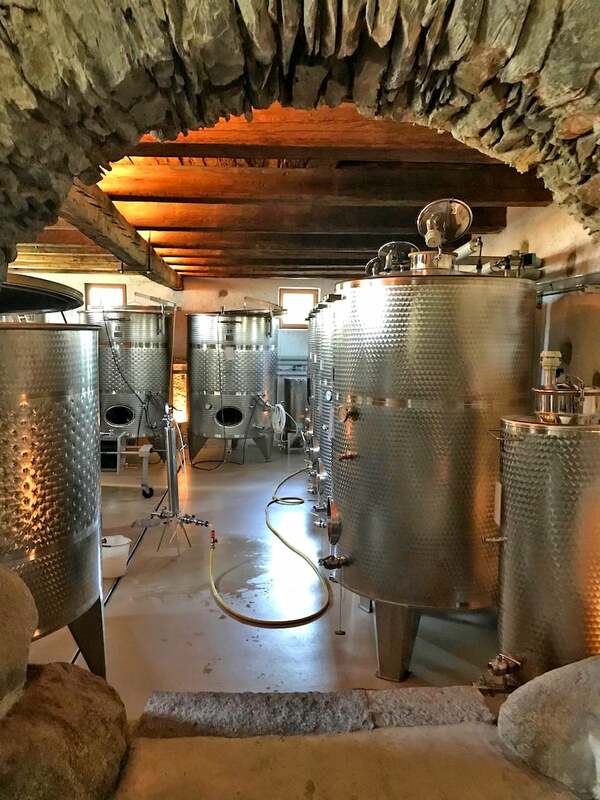 A palate-tickling taste of the delicious South Tyrolean wines, produced here by around 5,000 winegrowing enterprises, is definitely not to be missed. Although the wine-growing region is comparatively small, it is very diverse. There are about 20 different grape varieties. 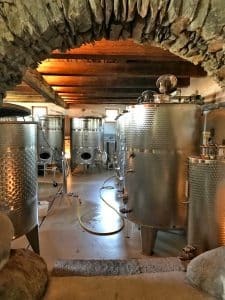 55 percent of them white wine vines, which enjoy excellent growing conditions in the mineral-rich soil and the microclimate. The Köfererhof owned by wine-growers Gaby and Günther belongs to the long tradition of the typical Eisacktaler vineyards. At 650 metres above sea-level, the grapevines grow and thrive on the 5,5 hectares surrounding the picture postcard farm in Vahrn. Well worth a visit.